Stabilization using Portland cement (PC) is one of the most widely used soft clay treatment methods. However, there are significant environmental impacts associated with the production of PC in terms of high energy consumption and non-renewable resources, as well as CO2 emissions. Some industry by-products/wastes have potentials to be applied in soil stabilization. 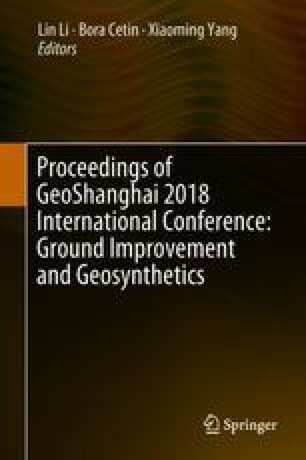 This paper presents an experimental study on the stabilization of a marine soft clay using the blend of two industry by-products: ground granulated blastfurnace slag (GGBS) activated by carbide slag (CS). The testing program involved unconfined compressive strength test, X-ray diffraction, and scanning electron microscopy. The results indicated that both CS-GGBS-stabilized and PC-stabilized clays had similar types of hydration products, including calcium silicate hydrates, calcium aluminates, hydrocalumite, and ettringite. However, the highest strength of CS-GGBS-stabilized clay was 1.5–3 times greater than that measured for PC-stabilized clay. The optimum CS/GGBS mass ratio varied from 0.2 to 0.3 for stabilized clay at different curing age and GGBS content. The authors would like to thank Liyang Gu, Pengfei Guo, Zhao Wang, and Sheng Chang for their assistance in laboratory. The financial support from Singapore MOE AcRF Tier 1 grant (RG184/17) is appreciated.